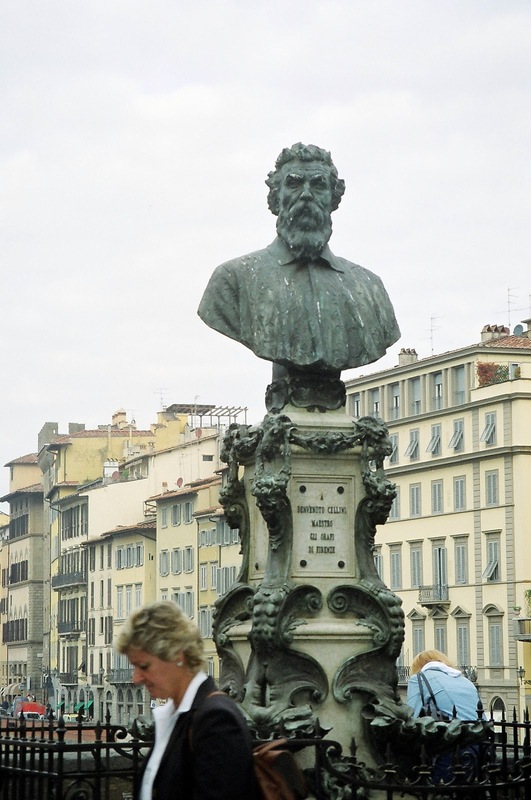 I know three things about Benvenuto Cellini (1500-71): that there is a bust of him on the Ponte Vecchio in Florence honoring him as the preeminent goldsmith of Florence; that his autobiography is considered one of the great books; and that Hector Berlioz wrote an opera (1838) with his name as the title. That would be it. The plot of the opera derives loosely from the autobiography and concerns itself with the casting of the above statue. I read in my sources that the original production of this opera set off a riot in Paris. The overture is absolutely gorgeous, especially with Gergiev conducting. We are doing Lost in Space, an ancient television series. This is supposed to be Rome during carnival, but that's only if you think there are ugly highrise buildings all over Rome. Teresa and her father live in a penthouse atop one of these ugly buildings, and they have two robots for servants. The robots reflect gender stereotyping--one boy, one girl. Teresa is reading Match, a magazine with Cellini's face on the front and her own on the back. Papa Balducci does not approve of Cellini. Cellini arrives with roses in a helicopter. There are balloons with smiley faces. Papa comes out with a rifle and starts shooting at him. Cellini wears a black leather jacket and looks quite disreputable--in short, he is a bad boy. Women can never resist bad boys. Papa's preferred suitor Fieramosca appears wearing a blue plaid suit. It always comes down to outfits. Cellini leaves Teresa a note saying he'll be back later, and they can go out. She prepares with the help of her robots, who give a manicure and pedicure and shave under her arms. As usual, she sings the aria twice, but changes her outfit between verses. The neighbors don't like Fieramosca and dump him down one of the chimneys. In the next scene we are at carnival. Cellini's fellow goldsmiths are dressed as rabbits, muscle men, etc, and sing the praises of their profession. Cellini is in his normal outfit. Ascanio, Cellini's assistant, is a robot that looks like C-3PO. 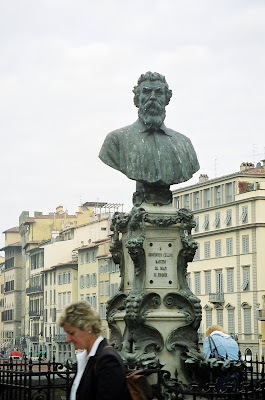 He reminds Cellini that he must cast a statue that evening for Pope Clement. Fieramosca and his friend Pompeo appear and discuss the fact that Cellini and Ascanio will appear at carnival dressed as monks. They decide to dress the same way and arrive at the same place. Then follows one of the most chaotic scenes I've ever seen in an opera. The stage is crammed with people dressed for carnival, many in skeleton suits. Musically it is not interesting. Everyone starts fighting and Cellini kills Pompeo with his sword. Then the cannon fires from Saint Angelo, ending carnival. The second act begins in Cellini's studio. There's some nice musical numbers in this scene. The Pope arrives in a car from the 50s with wings added, like an old red Fiat. Everyone kneels down, and he gives them all communion wafers. Two blond male dancers arrive with him. 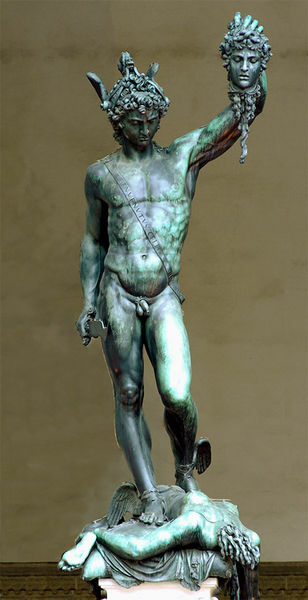 The statue in this production does not resemble the Perseus. The upshot of the whole thing is that if Cellini can successfully cast the statue for the Pope, he will be let off from the murder charge and allowed to return to Florence. I begin to understand why the commenter on my Giulio Cesare entry would blame it on the Americans. These outrageous productions look a bit like the current wave of American movies that are all taken from comic books or science fiction--or maybe science fiction comic books. Charlie Chaplin Modern Times mixed in, perhaps? Now the robot Ascanio's head is lying on the floor singing while his body is wandering around the room. He sings about how sad his soul is. This is a pretty nice aria. You get the idea. It has a happy ending, as it did in real life. One is alternately repulsed and attracted in rapid succession. Ascanio donates an arm to the casting. We are told the casting is a success, but we don't get to see the statue. As a kind of post script, I want to say that while transporting us far from the late Renaissance of the title character, this chaotic production is a worthy expression of the artist's equally chaotic life.